legitimate strategy for building black political power." My plan was simple, my intent genuine. I was going to obtain a copy of Amiri Baraka and the Congress of African People by Michael Simanga and write up an objective book review. It’s not going to happen. With each turn of a page in Simanga’s book, a floodgate of memories was opened. I realized I am too close to the story to maintain true objectivity. My introduction to the Congress of African People (CAP) closely mirrored Simanga’s. A group of us were building the St. Louis CAP chapter around the same time as the Detroit chapter was emerging. We both made treks to the national CAP headquarters in –as Baraka would call it - NewArk, NJ. There’s other subjective factors that come into play in responding to the book. My personal and political relationship with the author spans over four decades. My deference to Amiri and Amina Baraka as the most critical influences of my ideological and political development are unshakable. Yes, it was going to be difficult to pen a traditional book review but I must do my part to ensure that the historical place of CAP in the continuum of the Black Liberation Movement (BLM) and radical black traditions are firmly established. Some years ago (more years than I’d liked to remember), former members of the Congress of African People (CAP) met to explore ways to preserve the organization’s history. We also reminisced about life in our CAP chapters, sharing stories that were both humorous and moving. We helped one another fill in the gaps of information and details that were lacking due to our geographical locations or our political relationships. Our group contended that while much had been written about Amiri Baraka, CAP’s charismatic spiritual and political leader, very little had been written about the organization itself. We discussed pulling together documents, photos, videos, etc. in our personal possession and speculated about likely institutions which could be trusted to archive the collection. We were emphatic that if there was to be an authentic book about the Congress of African People, its members would have to write it. Further, as Michael Simanga asserts in his book, our gathering felt duty-bound to put CAP in the context of the "broader movement" and to memorialize "its lasting impact on black American political and cultural life." Simanga has masterfully done just this in Amiri Baraka and the Congress of African People: History and Memory. The author reminds the reader of the contributions CAP made to both the national and international spheres of political thought and struggle. CAP had Non-Governmental Organization status (NGO) at the United Nations. It also had formal relationships with several African countries as well as had ties to the liberation movements in the Caribbean, Africa and the Middle East. These efforts were instrumental to challenging U.S. foreign policy and the building of a viable Anti-Apartheid Movement in this country that contributed to the dismantling of the South African regime and the freeing of Nelson Mandela. CAP was one of few revolutionary nationalist organizations that saw the electoral arena as part of a legitimate strategy for building black political power. Its members helped to elect the Ken Gibson as Newark’s first African American mayor in 1970. We’ve seen the continued manifestation of that electoral strategy over the years, most recently with the election of the late Chokwe Lumumba as the mayor of Jackson, MS and Ras Baraka as the mayor of Newark. Baraka is the son of Amiri and Amina. Simanga chronicles the inherent contradictions in transitioning the organization from a nationalist formation practicing Kawaida to a Marxist-Lenist organization. CAP/RCL eventually merged with the League of Revolutionary Struggle during the anti-revisionist New Communist Movement. During this definitive decade of the 1970’s, there were concrete victories and contributions to be celebrated. But all was not sweet or smooth and Simanga points out a few of CAP’s contradictions and mistakes. There were internal struggles against patriarchy and around political lines in our united front work. There were the contentious relationships with CAP leaders Maulana Ron Karenga and Haki Madhubuti and the negative impact on our respective organizations and the BLM. Since the Ferguson Uprising, I have consciously moved towards paying more attention (and homage) to liberation history. I’ve believe our social justice movements are in need of huge transfusions of historical and political analysis in order to minimize re-inventing the proverbial wheel and to avoid repeating old mistakes. To the next generation, I want to pass on lessons of the past that don’t need to be repeated today. The cadre of CAP were mainly members ranging from 17-30 years old; we were a force to be reckoned with. We were taught that revolutionary rhetoric and slick sloganeering would not liberate our people, that one’s work was the real testament to how revolutionary you were. We were trained to tap into the power of our people by educating and organizing our communities. Young cadre who went thru the fires of study and ideological struggle developed as freedom fighters committed to the protracted liberation struggle of African peoples. Our young organizing teeth were not just cut in the participation in elections but also in organizing around community issues like police brutality, housing, education and incarceration. We were deployed as boots on the ground across the country to build for historic gatherings such as the National Black Political Convention in Gary, IN. and ALD in Washington, D.C., both happening in 1972. In the faces of the today’s young warriors rising out of the current urban crucibles, particularly around police terror, I see the faces of young CAP members and other youth who rose up in another period of black resistance. We, too, were angry about the state of our lives and eager to learn about how to transform ourselves and the world around us. It was the previous generation that took us under their wings to protect and educate us. Simanga’s book comes to us at an opportune time when a new generation of activists and organizers are hungry for knowledge about past organizations and movements, not just wanting to fantasize about them. They can benefit from analyzing CAP’s twists and turns and build upon its contributions and victories. I believe the compelling lessons can only make our movements stronger and wiser. BlackCommentator.com Editorial Board member and Columnist, Jamala Rogers, founder and Chair Emeritus of the Organization for Black Struggle in St. Louis. She is an organizer, trainer and speaker. She is the author of The Best of the Way I See It – A Chronicle of Struggle. 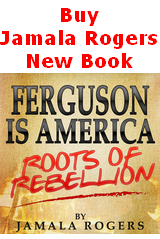 Other writings by Ms. Rogers can be found on her blog jamalarogers.com. Contact Ms. Rogers and BC.